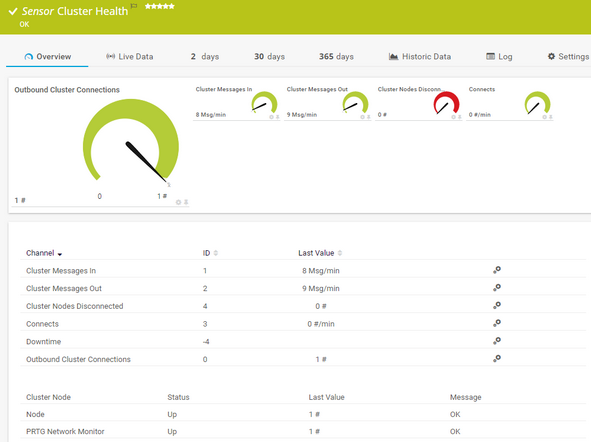 The Cluster Health sensor monitors the health of a PRTG cluster and indicates the PRTG own system health status. Number of connected and disconnected cluster nodes. PRTG creates this sensor automatically with a cluster installation. You cannot delete or add it manually. If at least one cluster node is disconnected, this sensor will show a Down status by default. You can review the states of each cluster node on the sensor's Overview tab . You can choose the cluster member of which you want to show data (or of all nodes) on the monitoring data review tabs.